Design and technology lessons are opportunities to test the boundaries of creativity in various materials, but before diving into this process it is important to give students an understanding of the basics. From safely using machinery to understanding the selection process of different supplies, these resources will help prepare your class for future lessons. Introduce your textiles students to the most useful tool they’ll ever know with this sewing machine game, before acquainting them with a range of basic skills as they make their own cushion with this comprehensive scheme of work. Before students reach for the oven or the hob, talk them through the importance of food hygiene with this colourful presentation and activity booklet. Alternatively, your budding product designers will benefit from working through this step-by-step guide on producing an isometric drawings. Simple activity I use this as part of Year 7s' sewing machine introduction activity. It works well with a smart board I ask the pupils to come and to tap where they think the part is. Its best to make a note of the order that the parts appear in the PowerPoint to ensure that you ask them in the right order! These resources include a full lesson by lesson scheme of work, a student booklet and powerpoint resources for each lesson. 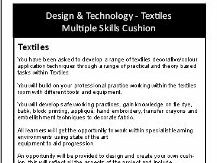 This project aims to introduce students to a range of different textiles skills including batik, tie dye, block printing, embroidery and basic sewing machine skills to manufacture a cushion. I have successfully been running this project for a number of years with KS3 students but it could be adapted for older or younger students. All files are editable so you can adapt for your studnets. Step by step of making an isometric drawing. This resource was produced to act as a step by step guide to making an isometric drawing. It was produced for my KS4 DT RMT and Engineering classes but I would be confident in showing this to KS3 classes also. I hope it helps, comments welcomed. Basic intro to food hygiene - PowerPoint and activity booklet. I used this with year 7's during their first lesson in the food room to prepare them for future lessons. The PowerPoint is quite brief and require class discussion - but feel free to modify it! I just went though and discussed each slide and got students to complete the relevant page in their activity books as we went along. As learners mature and food preparations become more complex, this detailed resource pack can be used to reinforce the dos and don'ts of knife safety. Or, why not assist your class with dressmaking using this pattern-drafting guide, which neatly breaks down the process into manageable chunks? Revisit the basics of product design with older students by sharing these comprehensive factsheets, which will check their understanding of the composition of different materials. Once comfortable, give pupils confidence in reading and producing their own engineering drawings with these introductory activities. Resources for GCSE Catering based on identifying and naming knives; selecting knives for different jobs; safety when using knives; looking after equipment. Some basic pattern drafting that I do as my first project with Y10. Explains how to adapt a basic block into a child's pinafore with a front yoke, centre front inverted pleat and buttoned fastening down the back. The students make it up in cotton chambray with appliquéd and embroidered detail on it (in a cotton print). I had to re-load this resource as it went &'missing&'; as I was trying to up-date it! Do what you like with these! Woods, metals, plastics, smart materials, composites. Sort the bare essentials! 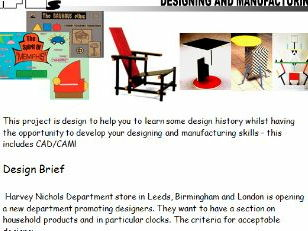 A detailed design brief to provide students with details to complete a designer inspired clock project. Aimed at AS product design students but suitable for younger students with some adaption. Editable document.